I'm starting a new meme for epiphytes, and I'm rolling it out with a contest! The prize is a goodie box of epiphytes, including cuttings of several rhipsalis, some bareroot dragonfruit seedlings, an epiphyllum cutting or two, some bromeliad pups, an orchid, and whatever else I have lying around. You can win by blogging, tweeting, and more, so read on, why don't you? The first day of every month will be Epiphyte Day... a day where people can post about orchids, bromeliads, rainforest cacti, and any other plant that grows in trees. To get everyone involved ahead of time, I'm giving you until New Years to write your blog post about your favorite tree dwelling plant friends, and I'll share all of the links on January 1st when the contest ends. I'd prefer that you write the blog posts as soon as you're able so I have time to tally your entries... and I'm excited to see what you write! 2. Leave a comment about your favorite epiphytic plant, or recommending a name for the meme. 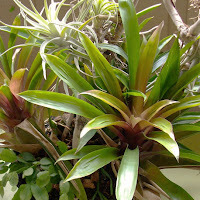 @rainforestgardn is giving away free epiphytes at http://www.therainforestgarden.com/ RT to enter! 5. Become a fan of The Rainforest Garden Facebook Page. 6. Share a link to The Rainforest Garden on Facebook. 7. Submit my page or one of my posts to Stumbleupon. Leave a separate comment every time you do one of these things. If you already follow me, or are a fan, it doesn't count... that way I don't enter people who don't even know about the contest! So you have more time to write up a blog post, the contest ends on January 1st, 2011 and I'll tally up the entries and randomly choose the winner in the next week. Rules and regulations are below. 1. Winner must be in the continental United States to receive plants. If you are outside of the continental United States, I'll send you a copy of "Bromeliads for the Contemporary Garden" instead. It's a great book too! I was already following you on Twitter and am a fan on Facebook, but I just tweeted about your contest. I know exactly what I'm going to blog about. An epiphyte I've had for about three years that has never bloomed. Ric-rac cactus! Love the foliage though, too! Loved your post and its about time you shared some pics of your huge birdsnest fern! Do you happen to know what the other fern on the palm trunk is? it seems to have sterile fronds reminiscent of a staghorn fern... but obviously the fronds are different... hmm. I thought that was how the birdsnest started! I will have to take better note as some of the other palms have those. I will keep an eye on them and report the progress. Even within the birdnest there are different types of leaves. Hi Steve! I got to thinking about it (took a whole day to do that), and I would have to say that my fav epiphyte is Spanish Moss! What a fun contest...I will do my post as soon as I can!!! Thanks! africanaussie: There is a birdsnest underneath the bigger fern... I've got to look up some stuff on the 'interwebs' to find out what you have! I really love that huge fern! Spanish moss is a great choice, and I'm glad you thought of it! I grow it along with some of my hanging baskets to act as a living mulch and retain humidity. Liked, friended on Twitter, and shared on FB. Awesome contest! I love cymbidium orchids. And bromeliads! Very cool idea for a contest. Sounds fun! I'll be happy to dust off my favorite epiphyte and enter what I've got. Do you want a photo...and can it be in pot and still be an epiphyte entry if it used to be an epiphyte in the wild? Anything you want to use is fair game, as long as it's an epiphyte! I can't wait! Oh crumbs, I've already unwired all the tillandsias, bromeliads and orchids from my palm and tree fern trunks for the winter and have brought them into the greenhouse. It's just too cold and wet here for them here. Maybe I can rustle up some photos from this past summer and write a blog post about it. In the mean time, tonight is the annual S.F. Bromeliad Society pot luck holiday dinner and meeting and I will mention your website to our members. Hello, can i just link an old post in my blogsite? That Bromeliad book is to beat for, as we dont have it here! thanks. Andrea, that works for me! I just want to get all the great posts on epiphytes in one place, once a week! And the bromeliad book really is great. I wish there were more on the subject. Name for meme? How 'bout "Gardening in the Clouds?" Post on my favorite epiphyte? Almost done. Let's just say this one not only hangs out in trees but provides a home to some insect pals and seems to be quite content in my kitchen. I'll link over when I'm done. Thanks for the compliment Steve. Here's a link to my favorite epiphyte, the ant plant! P.S. I added a blurb about your contest in my sidebar...can that count toward another chance? I don't Twitter, Facebook or Stumbleupon. Thanks!!! Hey, I am excited about reading everyones entries!!! Of course it counts, Julie! Thanks for getting the word out, and I loved your post on spanish moss! Its really taken for granted, isn't it? 3) What's Up? Epiphyte Meme ( I must say I'm proud of this one. Ok.we're good..Please consider the 3 I've submitted. Thanks. Thanks! Yes, I think it is overlooked a lot of the time...but just so luxurious! Merry Christmas to you and your family!! I also faved this on Stumbleupon. EEK! I love the black background you used for the tilly shots, NotSoAngryRedhead! I've been toying with the idea myself, but need to find a good and cheap black fabric first. I might go to goodwill and buy up a variety of colored sheets that match the blog's color scheme! Glad you got a great Christmas present! And then you don't have to deal with wrinkles. It also comes in a lot of different colors. Of course, if you need a larger background for a larger plant, you will have to get creative, but poster board is really easy to use. I highly recommend trying it out. I sometimes use a black foam-board for backgrounds, though it's less durable than I'd hoped when I got it. Some of the corners have gotten dented in a little, and there's a visible crease across one corner. Otherwise I use fabric, which is better for photos but takes longer to set up. Both the foam board and the fabric are sometimes annoyingly reflective, in certain light conditions, so I would recommend that you try to find fabrics with as matte a finish as possible, or find something you can spray-paint with a matte black finish. I wrote a post about epiphytes and linked here. I'm also going to say my favorite epiphyte is Anthurium andraeanum, though it's sometimes terrestrial so maybe it doesn't count. If I restrict myself to obligate epiphytes, then I probably have to go with Schlumbergera cvv. I love it! I need to figure out a more newbie friendly adaptation of that name... but the temptation to make a Fight Club-esque logo would be too great to deny. Maybe call it Epiphyte Club but design the logo on a bar of soap? You're a genius. Aren't they cool? Thanks for sharing! Hey Steve, Hopefully this will count towards another of the Weird Epiphytes. I will post around as much as possible. Link added to blog, posted on Facebook. I am going to post it on a bunch of my other garden websites. Want to see the posts when done? I know you said to post a comment for each thing we do, but I thought I could put it all into one post. 2. I added a link to this post in the comments of my post. 4. my comment about my favorite epiphytic plant is that I've had this phalaenopsis orchid for two years and I've never seen the blooms. I am determined to get this to bloom and I will be blogging about the steps I'm taking and the progress of the blooms (hopefully there will be progress to write about) :-). 5. I already follow you on Twitter and FB, but I just Tweeted about this contest. P.S. I can't wait to read everyone's posts! Okay, I will leave you alone now! Amy, thank you so much for doing all those things! There are so many entries now that I really need to consider giving away more than one prize... I visited your post and like how you shared tips that you'll be following. Its been my experience that phalaenopsis aren't as easy as say, oncidiums or cattleyas, but it looks like you're doing a great job! I didn't even know about some of those sites! I use gardenweb and follow cubits on twitter, but I really need to sign up and trade some plants! :) Like I commented to Amy, I might have to award two prizes since there are so many entries! I could do it on psd, but it would be more realistic to carve a real bar of soap and photoshop it to look like the original logo! You know, in all my free time. Maybe for the next round. I'm glad to hear that our giveaway has been such a huge success!! I've got my favorite Epiphyte posted just in time for your Carnival. Neoregelia 'Red Bands' is one of my favorites. It is extremely colorful with beautiful lime green and deep crimson banding each Autumn. It keeps its color all Winter and even into the Spring. It's a great grower and fast to multiply. I'm a little late, but my internet has been down for the last two days! (That's what procrastinating does...sigh) Just got it back this afternoon. In any case, I still want to share my post about my Ric Rac Cactus. I hope to learn more this year about epiphytes and succulents! Neat post! The second epiphytic fern in africanaussie's post is Drynaria rigidula. My favorite epiphyte is an orchid from Australia...Dockrillia teretifolia.